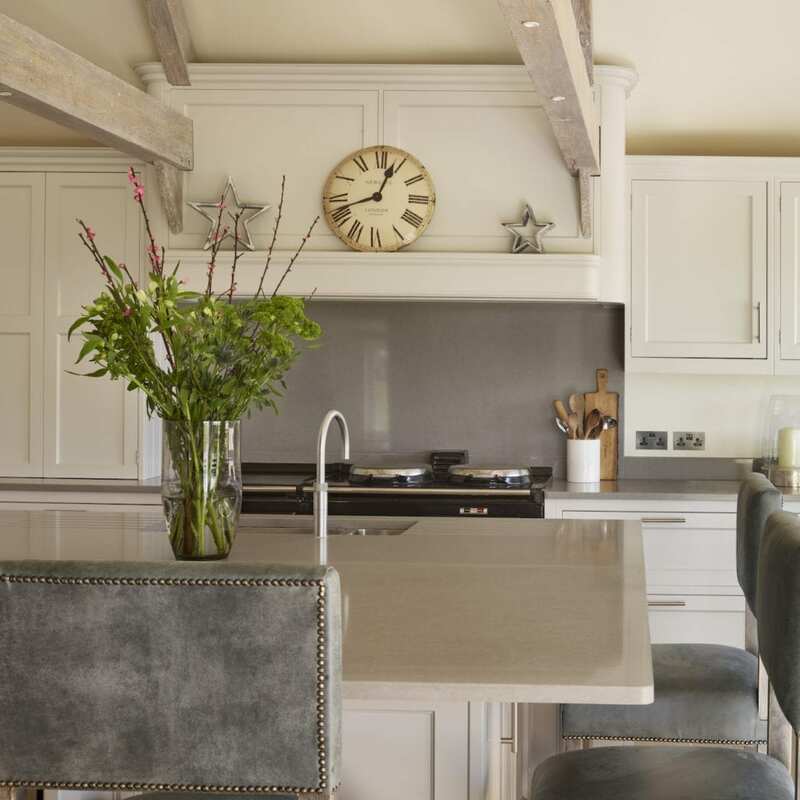 When Lou and Guy White were house hunting in the Berkshire countryside a stunning 6 bedroom barn conversion really stood out as their dream family home. 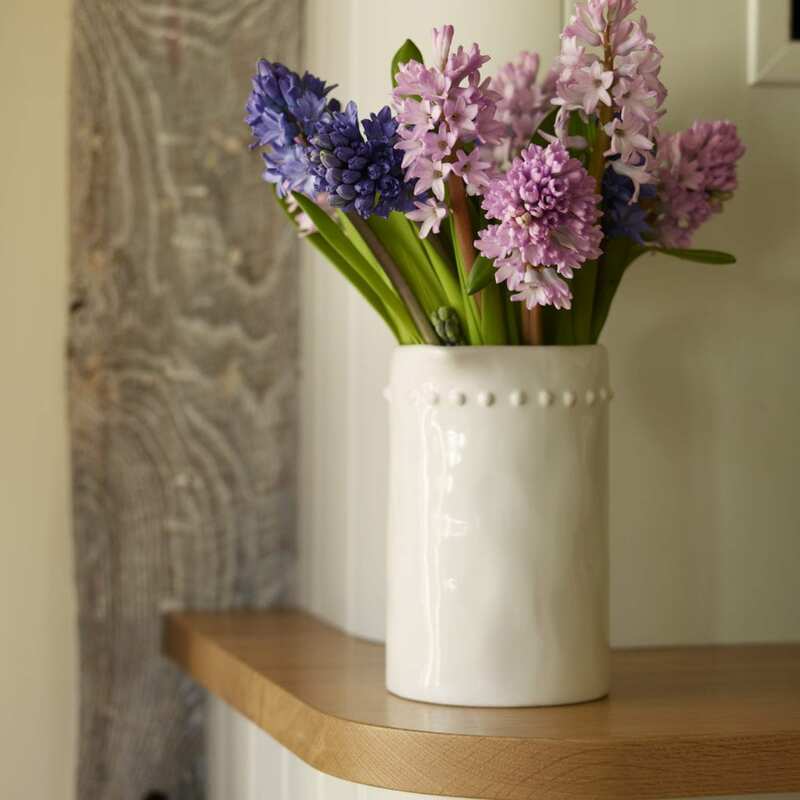 Now home to Lou, Guy, their three children and two dogs, the property, including the large kitchen-diner, has been altered to perfectly fit their busy family life. 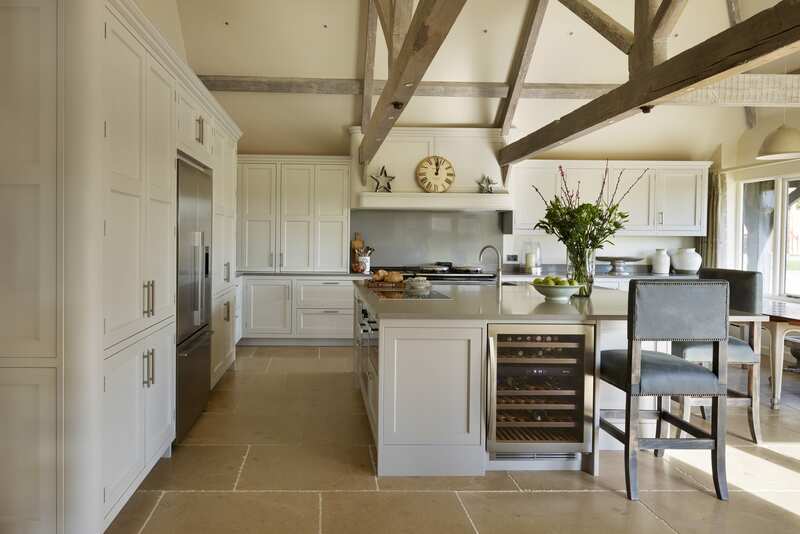 The vaulted ceiling in the kitchen and stunning views across the countryside gave the room character, however the overall feel of the space somehow felt crowded. “Although the beams looked beautiful, the large expanse of dark wood felt quite oppressive,” explains Lou. Therefore one of the first steps of the kitchen remodel was to lime-wash the beams; updating this beautiful original feature to make the room feel spacious and light. Having lime-washed the beams they became the main focal point in the room and so Lou and Guy chose an understated cornice to avoid drawing attention away from the original beams. A soft, neutral colour palette was also introduced to complement the beams and heritage of the building. 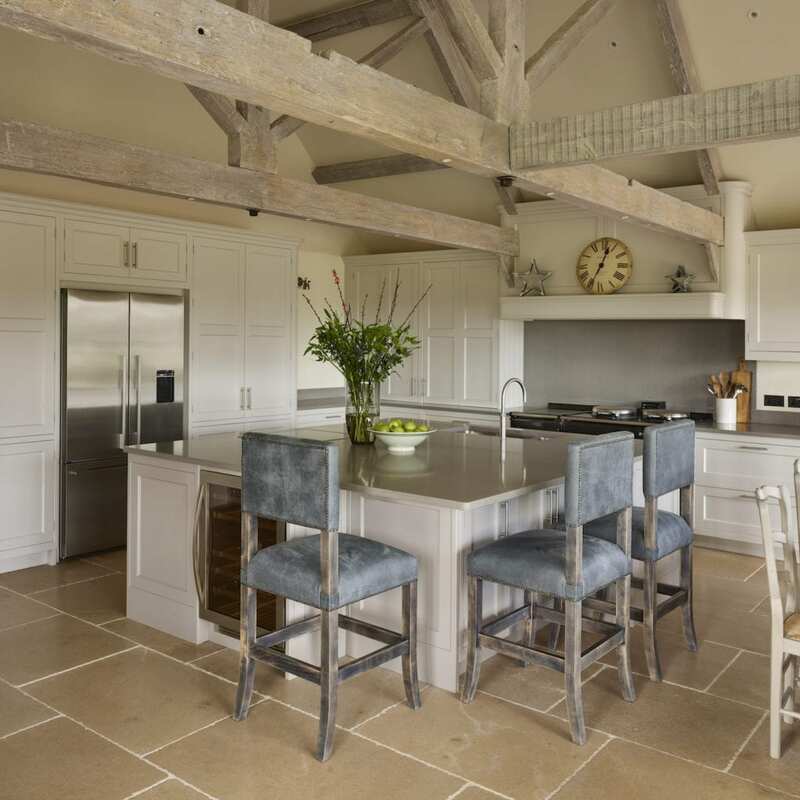 The layout of the room was designed for both everyday family life and more elaborate entertaining with the kitchen island at the centre of the design. “We wanted the island to bring the wow-factor, so it had to be big, but it sits perfectly in proportion with the room,” explains Lou. To give the kitchen island the wow-factor Lou was looking for it was designed to be multifunctional. The island features a selection of appliances including a Miele induction hob, oven and warming drawer as well as an under-counter wine cooler and the main sink. 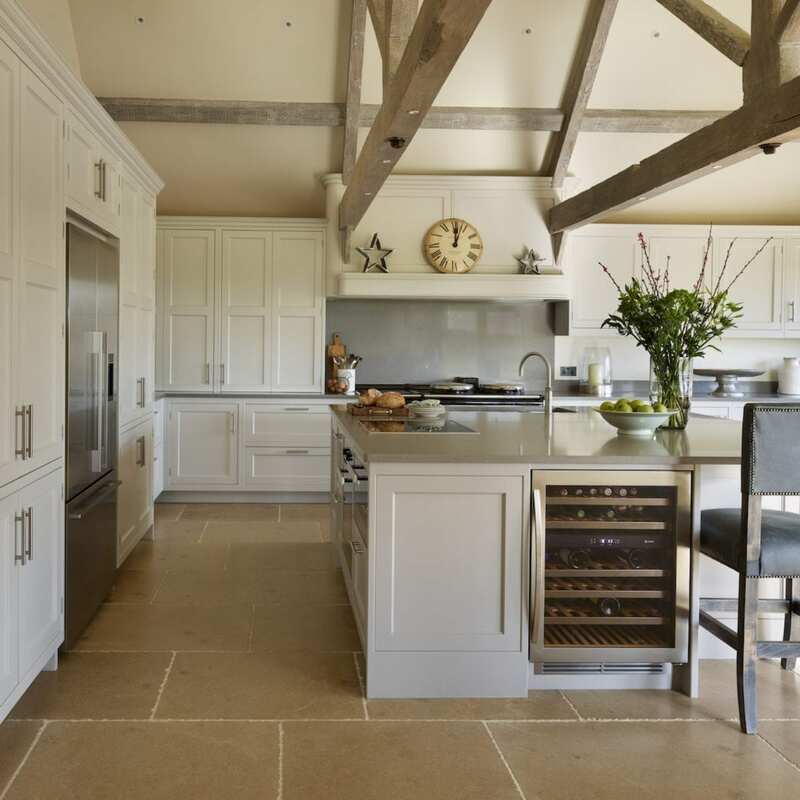 The island also boasts ample food preparation space within easy reach of the AGA and the induction hob as well as a breakfast bar. 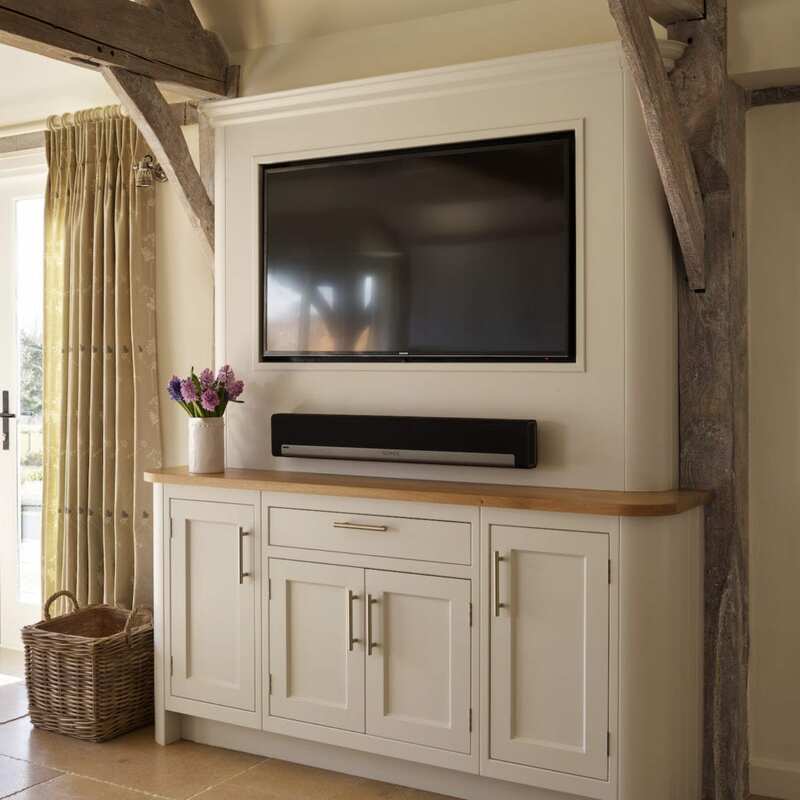 The extensive selection of appliances cater for a wide range of cooking styles; whether it’s a relaxed Sunday lunch or a complex 3-course dinner for friends, the appliances and configuration of the island are ideal for the dual purpose of the kitchen. The AGA was pre-existing from the previous kitchen and Lou fell head over heels for its warmth and unique cooking style and wanted it to be included in the remodel. 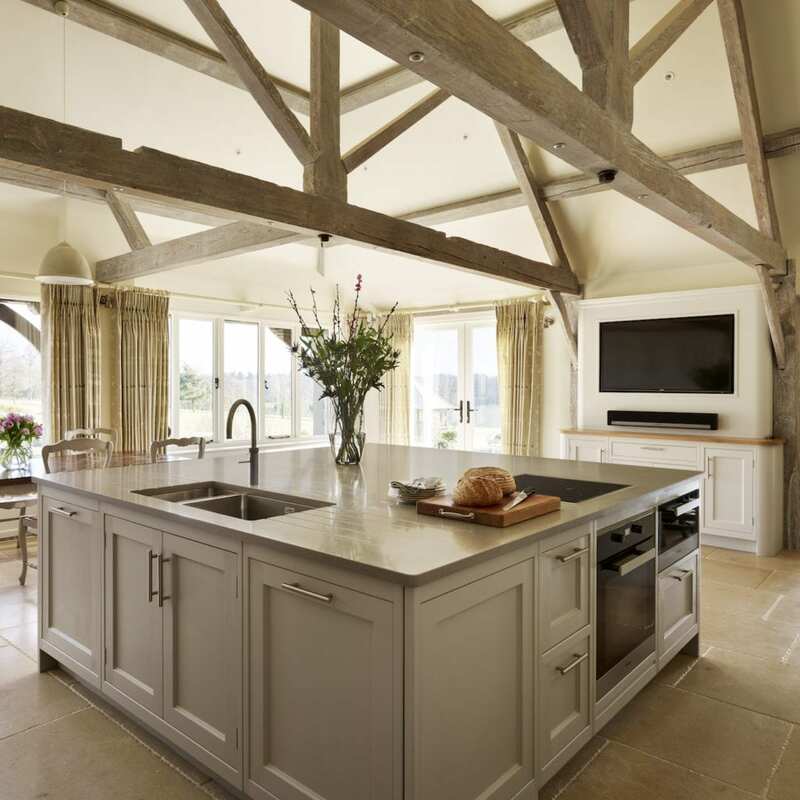 However, Lou and Guy both felt that the kitchen layout to accommodate the AGA in its original position was clumsy, so it was re-positioned between the two main beams in the room. 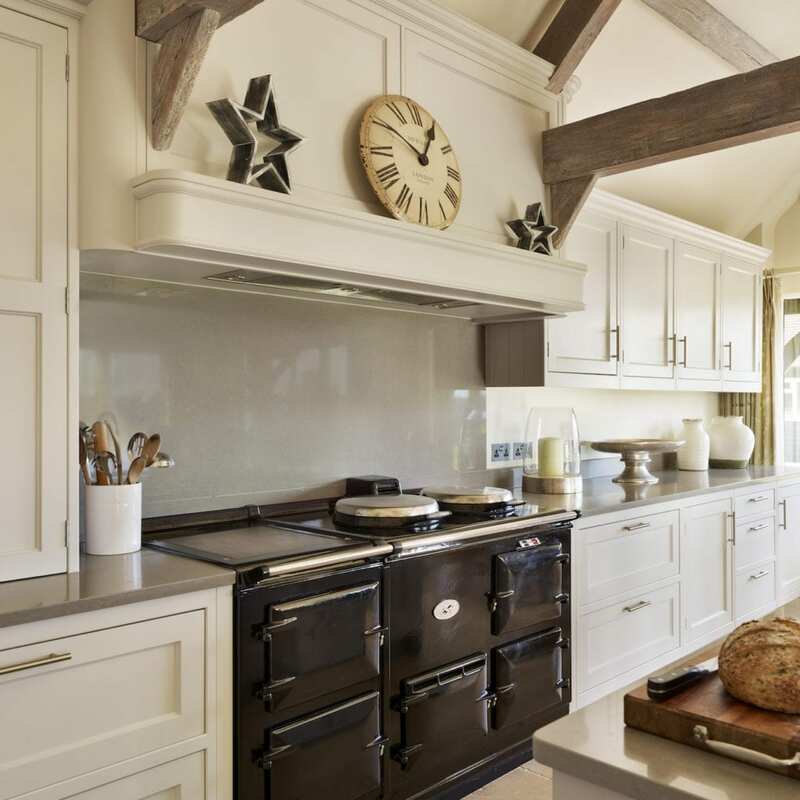 In its new home, the AGA is framed by a stunning bespoke canopy, designed to incorporate the original beams of the barn. 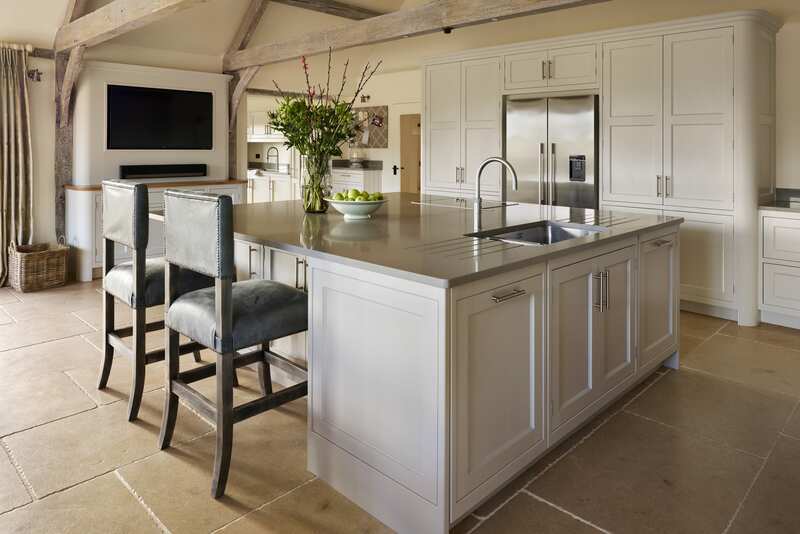 The revised positioning of the AGA better utilises the space in the room and makes way for the island, additional food prep space and informal dining table – all essential aspects of the original brief. 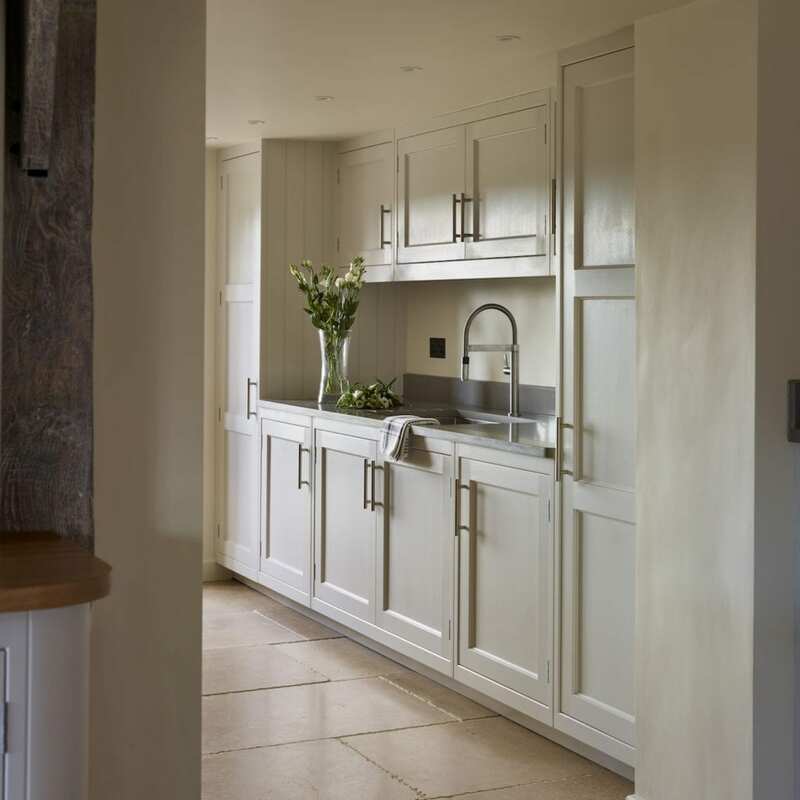 Another notable aspect of the kitchen design is the breakfast cupboard positioned on the worktop to one side of the AGA. This was designed to help Lou and Guy hide away small appliances, glassware and crockery. 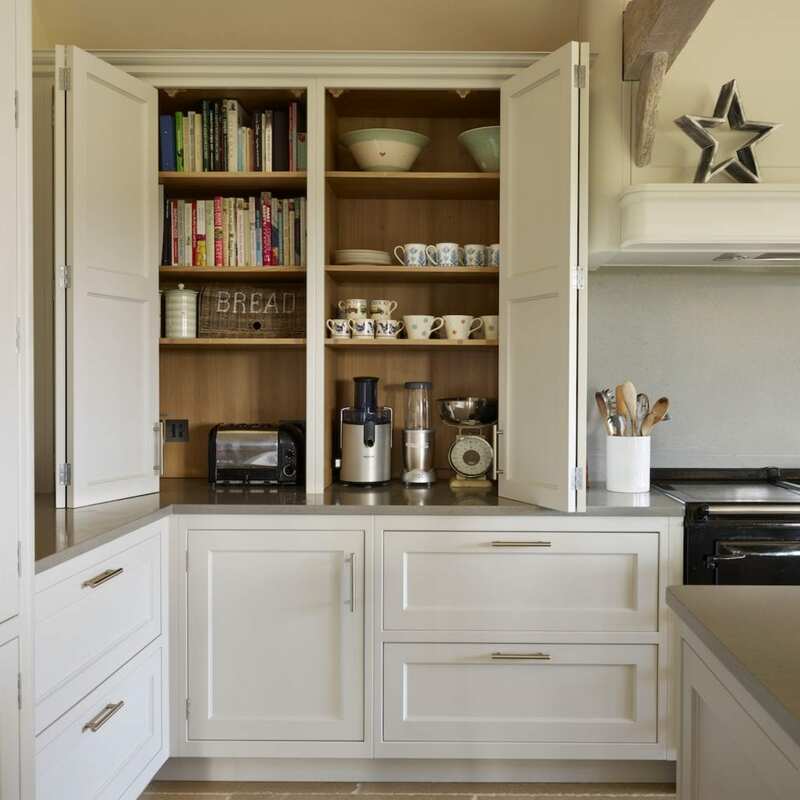 Positioning the cupboard directly on the worktop makes it easy to access the small appliances when needed and then hide them away again afterwards, leaving the surface clear to wipe and keep clean. “We wanted as little clutter as possible on the worktops. I love how I can shut the doors and everything looks neat and tidy,” explains Lou. Also designed to aid the couple’s quest for no clutter, the tap on the main sink is a Quooker hot tap which negates the need for a kettle – one less piece of kitchen clutter to hide away. In addition to the open plan kitchen diner Lou and Guy also took this opportunity to create a utility/ boot room that echoes the atmosphere of the kitchen. Positioned just inside the back door, the family’s main entrance to their home, this room includes all the usual utility room pieces you’d expect (washing machine, tumble dryer etc.) as well as a beautiful bespoke bench seat with additional storage. 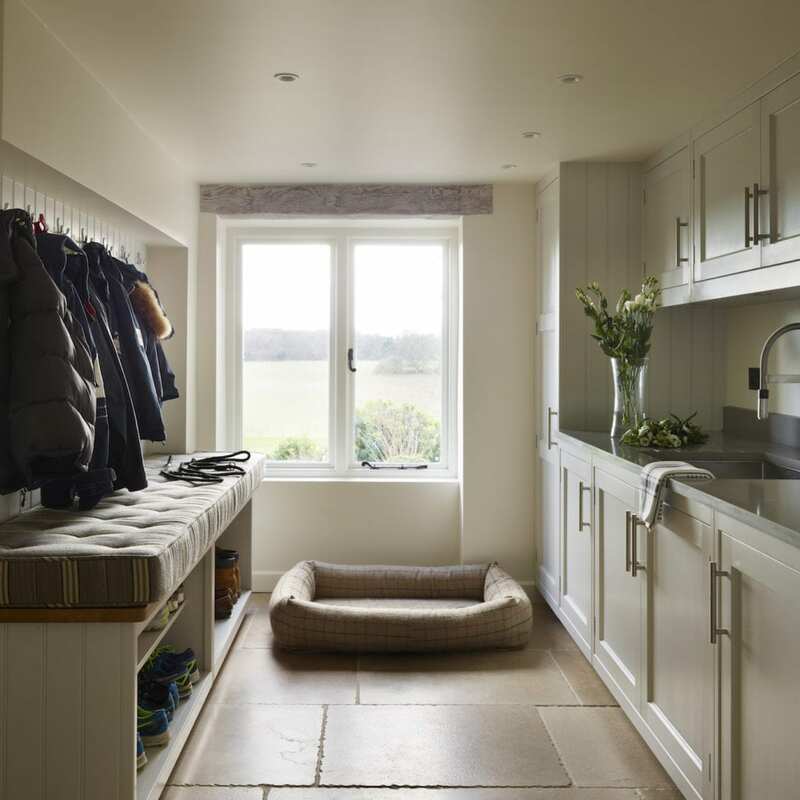 Each child has their own peg above the bench seat and extra storage space is integrated below the seat for football boots, wellies and other ‘dirty’ items. As this room leads off of the kitchen, Lou and Guy chose to continue their use of Davonport Tillingham cabinetry in a soft grey throughout. 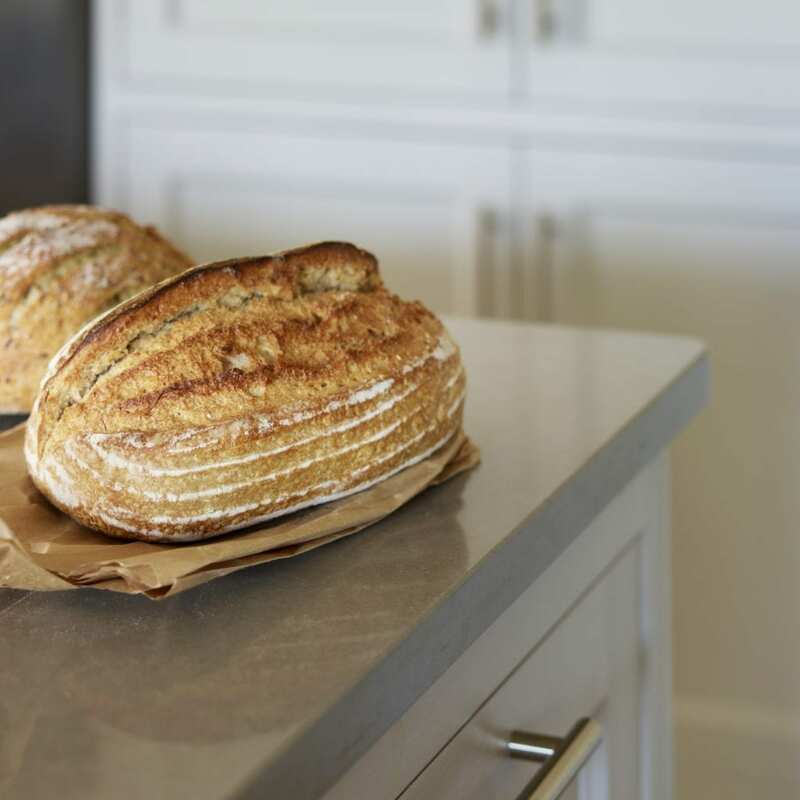 “I love how well our new kitchen works when we are entertaining. But the real success story is how it brings us together as a family,” concludes Lou.